Hill started the last two games at strong safety. 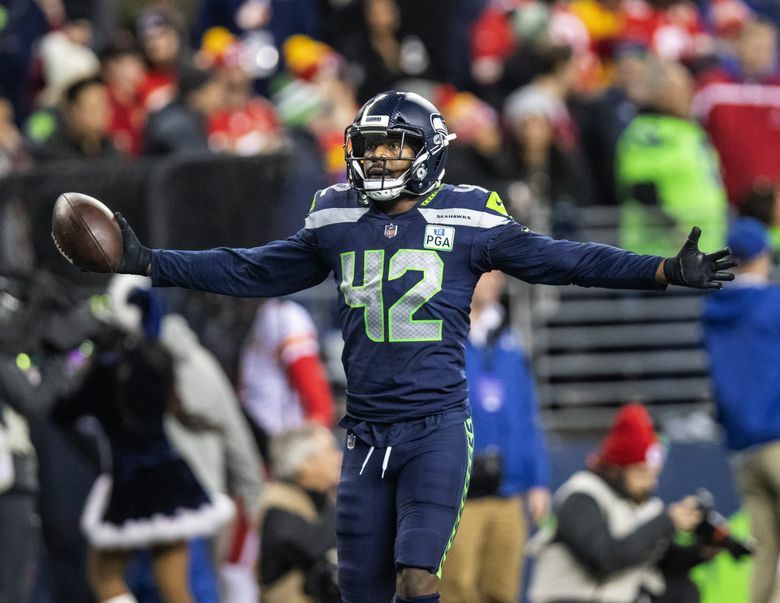 The Seahawks secondary took a hit Tuesday as the team prepares for Saturday’s wild-card playoff game at Dallas with the news that strong safety Delano Hill is done for the season with a hip injury. Hill was placed on injured reserve with what coach Pete Carroll said was a non-displaced hip fracture suffered in Sunday’s 27-24 win over Arizona, a game in which Hill played all 66 defensive snaps. Hill started the game at strong safety with Tedric Thompson missing a second straight game with an ankle, with Bradley McDougald moving to free safety. The good news for the Seahawks is that Thompson is expected back this week meaning he can again team with McDougald at safety. Those two have started together for 10 games this season, with Thompson moving into the starting lineup after a season-ending injury to Earl Thomas. “We are fortunate that Tedric is going to be back, yeah,” Carroll said. Hill, though, had also emerged as a key player in the team’s dime, or six defensive backs, formations as well as having played well in place of Thompson the last two weeks. Carroll, in fact, had seemed to hint during his radio show on Monday on ESPN 710 Seattle that the Seahawks could stick with the Hill/McDougald safety pairing even if Thompson were able to play. Seattle’s options for its extra defensive back packages could be further strained depending on the status of cornerback Shaquill Griffin. Griffin suffered a sprained ankle against Arizona and Carroll said he will not practice this week until at least Thursday, when he said the hope is he can get some work in and then be reassessed. Akeem King stepped in for Griffin against Arizona, playing 53 of 66 snaps overall, and Carroll said he would start at left cornerback if Griffin can’t go. King had thrived as a sixth defensive back in the win over Kansas City, specifically helping cover tight end Travis Kelce. Asked who would take over as the dime defensive back Carroll declined to answer. But the obvious choice would seem to be Neiko Thorpe, who filled that role in the final three quarters against the Cardinals, playing a season-high 15 snaps. But Seattle could also try backup safeties Shalom Luani or Maurice Alexander. Kalan Reed is also on the roster as a cornerback but has not played in a game all season. Seattle held Dallas to 137 net passing yards in a 24-13 win at CenturyLink Field on Sept. 23, the third-lowest total allowed this season by the Seahawks. But that was before Dallas traded with Oakland for Amari Cooper. Cooper has 53 receptions for 725 yards and six touchdowns in nine games with Dallas, all totals which lead all Dallas receivers. Carroll said receiver Malik Turner was signed from the practice squad to take Hill’s place on the 53-man roster. The Seahawks then signed safety Marwin Evans, who played in 32 games for the Packers in 2016 and 2017 with one start, to the practice squad. Evans is obviously being added as depth at safety with Hill out and as a hedge in case Thompson has setbacks. As he had said the day before on his radio show, Carroll said starting left guard remains a game-time decision as he attempts to return from a foot injury that held him out against Arizona. If Sweezy can’t play, Ethan Pocic is expected to again start at left guard. The good news is that D.J. Fluker is set to return at right guard, which will move Germain Ifedi back to his usual right tackle spot after he filled in for Fluker against Arizona. Seattle allowed a season-high-tying six sacks in that game and also had a hit-or-miss running attack. Penny missed two games with a knee injury and then played just four snaps against Arizona, getting the ball on each for a total of 6 yards, with Chris Carson taking an even bigger load of the carries (22, 27 and 19 the last three weeks). Carson has done just fine, rushing for 100 or more yards in each of those games (119, 116 and 122). But the Seahawks would love to be able to add Penny to the mix some more, especially if he can contribute as he did for a stretch at midseason when he had 44 or more yards in four of five games with a high of 108 against the Rams in Los Angeles, averaging 5.8 or more per carry in four of five games. The good news, Carroll said, is that Penny should be ready to do more after getting back into action against the Cardinals. Seattle has returned to the playoffs after a one-year absence. Still, even if one year isn’t that long to be away from the postseason, the ever-changing nature of the NFL means that the Seahawks have more players on their roster who have never been in a playoff game than have been — 28 of the 53 players on the team’s current 53-man roster have never played in the postseason. Six others have played in the playoffs but not with the Seahawks, led by tight end Ed Dickson, whose 14 playoff games, including earning a Super Bowl ring with Baltimore following the 2012 season, are the most of any player on the roster. Carroll said the task for those who have not been in the playoffs isn’t so much how they approach game day but the workweek that precedes it, especially with Seattle getting the toughest task that a team can have this time of year of having to travel on a short week. “We are working through and making sure that they understand how we approach it and how we do it and making sure we put together a great week,’’ Carroll said.